Rear-end accidents are one of the most common types of auto accidents that generally involve the front end of a vehicle colliding into the rear of another vehicle. These collisions can occur at high and low speeds and almost always result in significant material and physical damage to vehicle occupants and to the vehicles themselves. Unfortunately, many rear end collisions can be prevented as most are caused by drivers who simply fail to stop in time which is often the result of the at-fault driver being distracted, speeding or experiencing a mechanical failure. Have you or someone that you love been injured in a rear end accident, or experience significant damage to their vehicle? Did you know that the victim may be entitled to compensation for property damage, medical expenses, lost wages, and more? At the law offices of Harbin & Burnett, we offer 100% FREE consultations to help explore the details of your claim and we only get paid when we in. To find out how we can help with your compensation claim, simply fill out the FREE CASE REVIEW form to your right for a no-cost, no-obligation review of your accident claim. Alternatively, call our law offices today at 1 (888)821-0247 and speak to our legal team today. Driver inexperience is a common causes of rear-end collisions as new drivers are unable to fully grasp how slowly the vehicle in front of them is going and how much room is in between them. A study by the National Center for Statistics and Analysis of rear-end crashes in 2003 found that male drivers under the age of 18 are the most likely driver to be involved in a rear-end crash. Drivers who fail to properly maintain their vehicles brakes and tires can cause rear-end collisions as stopping can be much more difficult with poor tire tread and poor brakes. Drivers who recklessly drive in bad weather conditions may also not permit enough space between themselves and the vehicle in front of them while could cause a rear-end accident. When the front of end of one vehicle crashes into the back end of another, passengers in the backseat may suffer injuries as can those in the front seat. 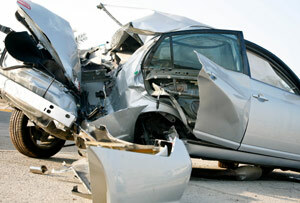 If a person was not wearing their seatbelt they are more likely to suffer serious injuries. The sudden jerk forward and back of such an accident is what makes drivers and passengers more susceptible to suffering neck injuries and head trauma should they collide with the dashboard or headrests. If you or a loved one has been injured in a rear-end accident caused by another drivers negligence, and the victim is seeking legal counsel, our attorneys can help. At Harbin & Burnett we are experienced in handling car accident claims and can help you fight for your right to fair and just compensation. Our attorneys have extensive experience negotiating and litigating and are committed to helping you get every dollar you deserve in the minimum time possible. We offer free home and hospital visits and can come to you to discuss the merits of your case. Your first appointment/consultation is free, there's no obligation and you'll never pay a fee unless you recover. Contact us today at 1-888-821-0247 and get connected with a tough, smart attorney that will work for you. You can also contact us online. Simply fill out the FREE CASE REVIEW form at the top right-hand corner of this page and we will contact you to discuss your claim.